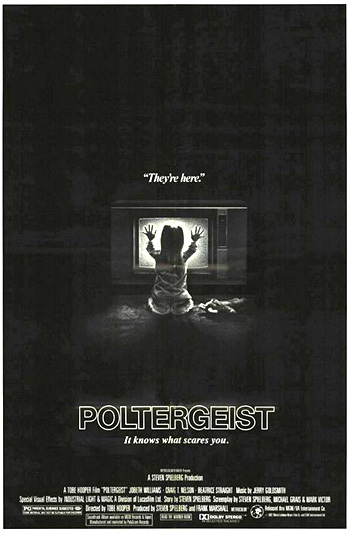 Poltergeist (1982) is a memorable supernatural horror film from co-producer/co-writer Steven Spielberg who teamed with director Tobe Hopper (known for his cult horror classic The Texas Chainsaw Massacre (1974)). It was Spielberg's first smash hit as a co-producer, who was paired with Frank Marshall (who later produced Who Framed Roger Rabbit (1988)). It was the highest-grossing (domestic) horror film of 1982 (bested by E.T. : The Extra-Terrestrial (1982) at # 1), and the eighth highest-grossing film overall in the same year. This classic 'haunted house ghost story' is fascinating to watch, with its extraordinary special effects created by George Lucas' Industrial Light and Magic team, and a screenplay by Spielberg, Michael Grais, and Mark Victor. However, in the early 80s, it was criticized for only receiving a PG rating (after the filmmakers protested its original R rating), given its intense scenes of horror - accentuated by the new Dolby sound system technology. In reaction (in part), the Motion Picture Association of America (MPAA) in 1984 created a new ratings category in between PG and R ratings - PG-13. This Spielberg production was released at the same time as another suburban tale with visitors: E.T. : The Extra-Terrestrial (1982). It could also be interpreted as a threatening, scarier version of director Spielberg's pre-E.T. film: Close Encounters of the Third Kind (1977). Compared to both films, Poltergeist was the dark flip side for Diane and Steve Freeling (Williams and Nelson) in the Cuesta Verde housing development of suburban California, with ordinary objects that turned threatening (for example, a suburban tract dream home, a backyard tree, a favorite clown doll, a closet, and a TV screen). Another tremendous trick scene was the one in which the camera slowly panned away from a kitchen table - and then returned to view a stack of chairs. Poltergeist III (1988) d. Gary Sherman (co-writer); with domestic revenue of $14.1 million; with the tagline: "He's Found Her"
Poltergeist (2015) d. Gil Kenan; a "revisionist" or "reimagined" re-make, starring Sam Rockwell and Rosemarie DeWitt as the parents (Eric and Amy Bowen) of three children: Kendra (Saxon Sharbino), Griffin (Kyle Catlett), and Maddy (Kennedi Clements). The film was nominated for three Academy Awards without any wins: Best Original Score (Jerry Goldsmith), Best Sound Effects Editing, and Best Visual Effects (Richard Edlund, Michael Wood, Bruce Nicholson). All three of Poltergeist's nominations were lost to Spielberg's own E.T. : The Extra-Terrestrial (1982). The film opens with the playing of the National Anthem during a TV station's sign-off. The highly-pixeled image is from a close-up, magnified shot of a television screen. The picture goes 'dead' - it is in the middle of the night. The head of the household, Steve Freeling (Craig T. Nelson) has fallen asleep in the downstairs living room in front of the tube. The family dog visits and introduces each of the members of the sleeping Freeling family in the upstairs bedrooms of their suburban home - thirty-two year old wife Diane (JoBeth Williams), sixteen year old Dana (Dominique Dunne), eight year old Robbie (Oliver Robins), and young, five year old blonde nursery-schooler Carol Anne (Heather O'Rourke). Hello? What do you look like? Talk louder, I can't hear you! Hey, hello! Hello, I can't hear you! Five. Yes. Yes. I don't know. I don't know. She awakens her parents and siblings, who stand in silence and watch her communicate with the grainy picture tube. She places her two palms on the glass. They live in the peaceful Cuesta Verde Estates tract housing development - their house is indistinguishable from other subdivision homes. The bedroom of the two youngest children is decorated with other-worldly items - two Star Wars (1977) characters (R2D2 on the bedspread and a Darth Vader toy figure on the shelf), two related film posters, an Alien (1979) poster from the science fiction horror film, and CLUE - a classic who-dun-it board game. (a piece of red licorice) For when he's hungry. (a polaroid picture of Carol Anne, Robbie, and the family dog) For when he's lonely. (a yellow napkin) And for when it's nighttime. Nocturnal somnambulism. You know what? You know what? I will bet you anything it's genetic. I mean, Carol Anne last night, and all last week, you know, and me when I was ten...You know, I once slept-walked four blocks. And I fell asleep in the back of this guy's car. He drove all the way to work before discovering me. Oh God, I woke up. I started screaming. People came running from everywhere. They called the cops. The cops came. They took this poor dude downtown. My father...Big Ed has me examined for like bruises and hickies. Oh you name it. Oh God, I was so embarrassed. Oh s--t, Steven, what if we, like, dig the pool, you know, and Carol Anne sleepwalks and she falls into it before there's any water? Robbie: I don't like the tree, Dad. Steve: It's an old tree. It's been around here a long time. I think it was here before my company built the neighborhood. Robbie: I don't like its arms. (whispering) It knows I live here, doesn't it? Steve: It knows everything about us, Rob. That's why I built the house next to it, so it could protect us...It's a very wise old tree. Robbie: It looks at me. It knows I live here. Diane: Well, who did you mean? Who's here? Suddenly, other odd paranormal events begin to occur in their house. Robbie's milk glass breaks in his hand. Robbie's fork and spoon are unusually bent and twisted. Carol Anne switches the TV channel to a station with static, and stares at the snow. Her mother thinks her habit is unhealthy: "Oh honey, you're gonna ruin your eyes. This is no good for you." She turns the channel back to another channel playing a violent combat film. When Diane returns to the kitchen, all the breakfast chairs have been mischievously pushed away from the table. Her daughter startles her and Diane reacts: "Don't do that honey! You wanna see Mommy lying in a cigar box covered with licorice?" She turns her back for just a few moments, walks to the cabinet under the sink, [the panning camera follows her with one long take], and then turns back toward the table - the chairs have repositioned themselves in a balanced configuration atop the table. The next scene transition is crisp and neat - Steve is showing an prospective couple of buyers the same kitchen configuration in "Phase Four" of the housing development. He is the "best rep" of the real estate company that cleared the land. As part of his sales pitch, he explains how he himself lives in Phase One, built earlier: "We were the first family to set up housekeeping in the Cuesta Verde Estates...We had to pass through my neighborhood to get here." It's like, it's like, there's this tickling, you know, right in here. And it starts to pull you. The tickling pulls you. And all of a sudden, it's like there's no air except that you can breathe. When they speak to their neighbors the Tuthills, the Freelings are the only ones being attacked by biting mosquitos. They feel foolish explaining what's happening in their home: "Somethin's funny goin' on here next door. Somethin', uh,...We were wondering if maybe you had experienced any disturbances lately?...Oh you know, like dishes or furniture moving around by themselves." They decide that they will call for help, but aren't quite sure where to turn: "I already looked in the Yellow Pages. Furniture movers we got. Strange phenomenon, there's no listing." Another dramatic storm threatens the community that evening - the arm branches of the tree outside Robbie's window become animated, crash through the glass, and seize him from his bed. [This scene was inspired by Spielberg's own childhood memories.] As the Freelings are diverted from the bedroom to go outside to rescue their son from the grasp of the tree, a menacing tornado similar to the one in The Wizard of Oz (1939) approaches. Strange noises emanate from the blinding brightness of Carol Anne's closet - toys, stuffed dolls, furniture, and other objects are sucked into the white-light. As she holds onto her bedboard, her legs dangle vertically in mid-air. The grinning doll is pulled through the air into the void - Carol Anne can't resist the strong forces and she is sucked in too. The bedroom is stripped bare. Outside, the tree half-devours Robbie, but he is rescued by his father, just as the gnarly tree is whisked away in the swirling eye of the tornado. When the family returns upstairs, Carol Anne has disappeared - she has been kidnapped into the spirit world which has found a gateway through the bedroom closet. The parents panic, fearing that she has been drowned in the muddy hole being dug for a swimming pool next to the house. Her metallic, echoing voice can be heard behind the grainy picture screen of the television in their bedroom: "I can hear you Mommy. Where are you?" Steve: Dr. Lesh, I don't care about the disturbance, the pounding and the flash, the screaming, music. I just want you to find our little girl. Ryan: Mr. Freeling, we'll record any psycho-tronic energy or event. Dr. Lesh: Yes. Ryan photographed an extraordinary episode on a case in Redlands. Ryan: That's right. It was a child's toy. A very small matchbox vehicle just rolled seven feet across a linoleum surface. The duration of the event was seven hours. When Steve opens the door to the children's bedroom, the space is swirling with psychotronic energy displayed with marvelous special effects - a lamp, lampshade, records, books, and toys are in mid-air circling around the beds. The base of a table lamp inserts itself into a lampshade and turns itself on. A book flutters its pages at them. A student's circle-drawing tool flies dangerously into Dr. Lesh's awe-struck face. A spinning record plays. Marty: Poltergeist disturbances are of fairly short duration, perhaps a couple of months. Hauntings can go on for years. The half-skeptical researchers want to record the spirits with video cameras and audio recorders, and find some scientific reason for the disturbances, but they have little luck. Diane and Steve attempt to speak to Carol Anne's voice through a particular channel on their television. Their daughter responds: "Mommy, where are you?...I can't find you, I can't! I'm afraid of the light, Mommy. I'm afraid of the light." With Dr. Lesh's urgings about the danger of the 'light,' Diane warns: "Stay away from the light. The light is dangerous. Don't go near it. Don't even look at the light." Objects are regurgitated from a spot on the living room ceiling with accompanying clouds of smoke and light - wristwatches and other items of jewelry covered with dusty slime fall to the floor. Even more disturbing is Carol Anne's next horrible revelation: "Mommy, there's somebody here...Mommy, somebody's coming. Mommy, Help me, please!...Get away from me. Leave me alone." At the foot of the stairs, Diane feels ecstasy as her young daughter moves through her and leaves an imprint: "She just moved through me. My god, I felt her. I can smell her. It's her...She's all over me...She went through my soul." A loud pounding and growling noise followed by a blast of wind move powerfully through the room. Marty, who has gone upstairs to check if the voice emanates from a CB transmitter somewhere in the house, emerges from the upstairs with a bruise on his side: "Something took a bite out of me." There's been some ionization flux. I'd like to make sure they're not caused by humidity coming from structural leakage, but I'm not goin' up there to find out. We have got much more than the paranormal episode taking place here. There's measurable physical signs in this house that goes far beyond any of the creaking doors or cold spots I've ever experienced. The voices on television - where is it coming from? The absence of a signal on the channel that is not receiving a broadcast means that it is free to receive a lot of noise from all sorts of things - like short wave, solar disturbances, car ignition sparkings, outer space - or inner space. Yes, what if these people had an aerial by location in their own living room. If that is the way out (he points up at the living room ceiling), then maybe somewhere in this house, there's a way in. Parapsychology isn't something you master in. There are no certificates of graduation. No licenses to practice. I am a professional psychologist who spent most of my time engaged in this ghostly hobby, which makes me I suppose the most irresponsible woman of my age that I know...I'm absolutely terrified. It's all the things that we don't understand. I feel like the proto-human coming out of the forest primeval and seeing the moon for the first time and throwing rocks at it.